Follow your own personal maid guide as she takes you deep into the heart of Akihabara, to places tourists don't usually go! We'll take you to the center of the anime, manga, games, and figurine culture which began in AKIHABARA. 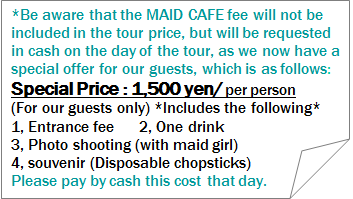 Including a unique experience at a real Japanese maid cafe! On this two-and-a-half hour tour, your guide will provide an unforgettable explanation of all things AKIHABARA which you won’t be able to find in the guidebooks. 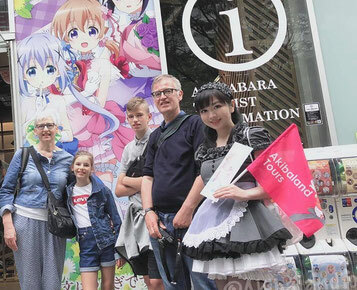 Our guides are bilingual in English, Spanish, French and Japanese ask them anything about AKIHABARA! We accept online payment via PayPal. Payment information and invoice will be sent to you by email. Ground floor of "Chom-Chom" Building. Here is near by JR Akihabara station, Central Exit. I'd like to ask you to arrive 10 min. before the tour starts. *Please take care of your personal items at all times. We cannot accept responsibility for any possible loss, theft or damage.In the event of unforeseen circumstances at the location of the tour, there may be changes to the days of operation, content, schedule or cost of the tour. In the event that a cancellation is made after registration for the tour, a cancellation charge may be levied. Please check upon registration.